Are Blind Spots Killing Your Business? Sign up today and grow your business! What if a blind spot existed in your business? We’re all familiar with blinds spots when we’re driving, and are cautious about double checking them in traffic. What if you had more than one blind spot connected to your company? Remembering that these are areas we should be able to see, but cannot see them properly, how would you even know? - How strong is your bench? - What 3 or 4 steps do you consistently follow to find the best possible job candidate? - What do you do when your staff brings you a problem? - Do performance reviews differ throughout your organization? - Does important company knowledge & practices walk out the door forever if you lose a key employee? - How long does it take a new hire to be profitable or make a contribution to the organization? - Can your managers tell you the top two gaps they’re working on with each team member? - When was the last time your managers attended a training program that didn’t involve new product information? - How many new conversations does your sales or business development team need in a given week in order to hit their quota this quarter? - Do you have systems & processes for every repeated activity in your business, and is everyone held accountable to using and following the systems and processes? If you’re uncertain about your response to any of the 10 questions, you may have a blind spot within your organization. Sometimes, we simply don’t know what we don’t know. Other times, we purposely choose to ignore things in order to deal with the priority of the day. Either way, how much could any of these potential blind spots cost your organization? 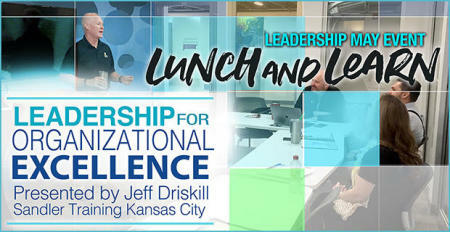 If you’d like to learn more and see if your company has any blind spots, or discover how to overcome the blind spots that exist, I’d like to invite you to join me for a Lunch and Learn. There’s no such thing as a free lunch, but for $35 I’ll have lunch waiting on you when you arrive, and I’ll send you home with the book The Road to Excellence by David Mattson, President/CEO, Sandler Training (retail $26.95). In the book, Dave discusses the “Blind Spots Syndrome,” and reviews ideas for organizational improvements. I look forward to seeing you at one of these Executive Briefings, but if you can’t make it, let’s find time to discuss your businesses blind spots over coffee.